It’s been awhile since an online pokies site has impressed us as much as Mucho Vegas, with its vibrant and cheerful Latin theme helping to set the scene for the fun and exciting game experience that lies ahead. We go over all that Mucho Vegas Casino has to offer to give players an understanding of why this has become our top-rated online casino site for real money pokies. 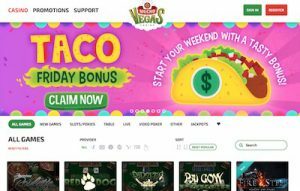 Like most of the other casino sites we recommend, Mucho Vegas is fully available in instant-play mode, which means games can be played directly over your Web browser with no downloads needed. You don’t have to be a member of the casino to experience all that the site has to offer, and can head to MuchoVegas.com right away to sample games for free in practice mode with no risk and no commitment. To play for real money, click here to register, and you will be required to enter your name, address and phone number while creating a username and password. Once your account is set up, go to the deposit section where you can choose from a range of safe payment methods, which are available in multiple currencies including AUD, EUR, USD, SEK, NZD, NOK, BRL, MXN, ARS and ZAR. Most deposits are processed on the spot, so you can start playing Mucho Vegas’s games straight away by scrolling through the hundreds of titles available under each game category. Mucho Vegas allows you to search for games by type, software provider, alphabetically or by title. Plus, if you make it all the way to your seventh deposit, you’ll also receive 150 free spins to use on selected slot games. All bonus money issued as part of the welcome bonus is subject to a 30X wagering requirement. Beyond the welcome package, we love that Mucho Vegas has a selection of other ongoing and one-off promo offers for registered played, like the Midweek Reload Bonus, Taco Friday Bonus, Free Spins Monday and plenty of others. Note that all free chips earned by Fiesta Points are subject to a 30X wagering requirement. Points work differently for players from Sweden and Norway – refer to the promotions page at Mucho Vegas for further details. This is just the tip of the iceberg, with tonnes of other titles available including a range of games from other software developers like GameArt, Oryx and Intervision. Games from major providers NetEnt and Microgaming may also be available depending on what country you’re playing from (they are region blocked to players from certain locations). New releases are added regularly, so fresh content is never far away for regular players. Does Mucho Vegas have mobile pokies? Absolutely – head to MuchoVegas.com using any data-enabled smartphone or tablet and you’ll find a large selection of online slots optimised for mobile play. The mobile platform is very well laid out and incredibly easy to use, offering a vibrant place to play free or real money pokies on the go from any Wi-Fi, 3G or 4G connection. Mucho Vegas isn’t just about the pokies – you’ll also find a great selection of other classic and unique casino games on offer here from the software developers mentioned above. With non-pokies games split into categories including Table, Live, Video Poker and Other, Mucho Vegas offers a wide variety of roulette, blackjack and poker variants, plus baccarat, craps, keno, scratch cards, virtual sports and other niche arcade-style games. For the live dealer fans, you’ll be happy to know Mucho Vegas hosts a selection of live games from leading live game studio, Evolution Gaming. There are different minimum and maximum deposit limits available for each – you’ll find these details listed under Mucho Vegas’s banking hub along with a description of how each payment method works. Is Mucho Vegas recommended for online pokies? Mucho Vegas has become one of our top-rated and most highly recommended online casinos. It offers everything one could need from an online casino – it’s visually attractive, well laid-out, offers a huge selection of games, caters to a large list of deposit options, is secured by 128 Bit SSL digital encryption security, has multiple bonus offers and is fully licensed and regulated by Curacao eGaming. We have no hesitation recommending this game to any real money pokies enthusiast – visit Mucho Vegas today to see for yourself why this is fast becoming one of the most popular online slot sites on the Web.